Dave Chase is the founder and CEO of Avado, a TechCrunch Disrupt NYC finalist. Previously he was a management consultant for Accenture’s healthcare practice and was the founder of Microsoft’s Health business. This is Part II of a two-part post. You can follow him on Twitter @chasedave. Over 1/3 of the workforce is expected to be permanent freelancers, contractors, consultants and entrepreneurs with zero expectation of employer provider insurance. They have high motivation to become literate on health economics when paying directly for their own health plan. Health plans are still designed and sold to groups rather than individuals even though nearly half the population will be buying health plans directly rather than receiving them via their employer. 110MM Americans are covered under what are called Self-funded Plans. What that means is a large employer directly pays for their employees healthcare versus having an insurance company manage the risk. They are aggressively pursing their own DIY Health Reform and aren’t waiting around for DC. As has been seen in Massachusetts with their health reform, a massive new wave of people will be brought officially into the healthcare system when insurance mandates kick in 2014. This particularly strains the pre-existing shortage of primary care physicians. It’s well understood that aging Baby Boomers will strain the system like nothing before it. Nearly half of all Americans have a chronic disease. This consumes 75% of all healthcare spending for a total of $1.8 Trillion (yes, with a “T”). Over half of people don’t follow their doctor’s care plan. While some are explicitly ignoring their doctor’s advice, most simply forget or misunderstand the directions they were given. The only hope to address this convergence of factors is to reshape how care is delivered and paid for. Among other things, it’s imperative that there’s greater efficiency — an area where technology has demonstrated it can play a role time and again. Whereas technology has brought incremental efficiency in healthcare, organizations such as Qliance and OneMedical have utilized technology for radical transformation. It’s no coincidence that they are backed by the founders of Amazon, aQuantive, Dell, Expedia, and venture firms such as Benchmark — all organizations that dramatically altered their sectors using technology to disrupt their industries. 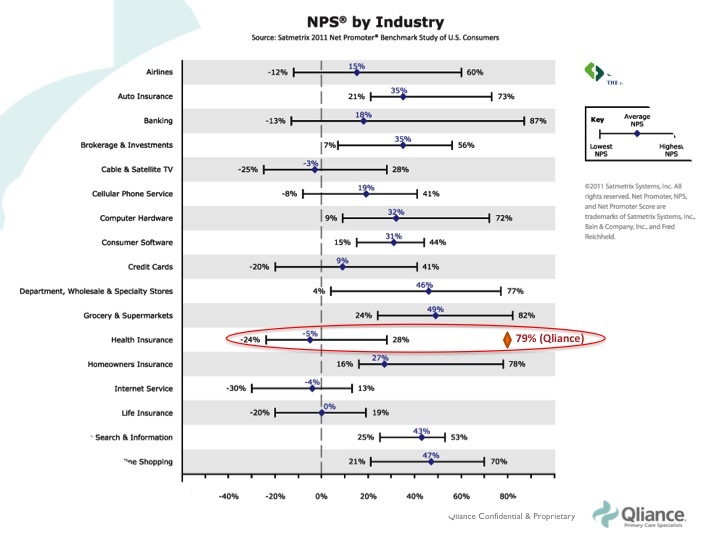 The graphic below shows how Qliance has earned a Net Promoter score higher than Google or Apple in a sector that has the lowest average Net Promoter Score of any industry. You can also see Yelp reviews for Qliance and MedLion to get further anecdotes. Interestingly, in the transformative models described earlier, doctors consistently tell me that half to two-thirds of their patient interaction time doesn’t need to be face-to-face (the legacy insurance reimbursement model requires face-to-face appointments for the doctor to get paid). They can deliver high quality medicine without being in the same room as them. By spending less time on insurance bureaucracy, they are able to spend 2 to 8 times more time with patients and still make a reasonable living. These longer appointments aren’t simply a luxury. They’ve demonstrated they can save money and improve outcomes. In the legacy model, a typical 7-minute appointment only allows the doctor enough time to address one symptom with limited time to address the underlying issue. One doctor operating in a non-insurance primary care model gave me the example of a female patient describing symptoms of terrible headaches. He said that in the old model, he would have ordered an expensive CT scan to understand if there was something going on. Instead, over the course of a longer discussion, he found that the lady’s mother-in-law had recently moved into her house. Instead, he “prescribed” setting boundaries, going for walks and other stress-relieving measures. If employers have been looking for an exit to employer-sponsored health benefits, they may have found one in the new health reform law. According to the just released employer survey by McKinsey and Company, upwards of 30% of the 1,300 employers surveyed “definitely or probably” will drop health coverage altogether and instead pay the $2,000 per employee government mandated fine. The flee rate gets even higher when focused on those employers with a high awareness of the new law – more than half (50%+) employers indicating plans to exit health benefits. Putting aside the political issues, the implication is that even more people will become healthcare consumers where they’d previously had that decision handled for them. While I’d expect that the impact of the DIY Health Reformers will be more immediate, the opportunity only increases with government-driven health reform. The CTO of the U.S. recently laid out just how big the opportunity is in the video below. Due to the scorched earth in Health IT for startups, it’s understandable why mainstream venture investors have been reluctant to invest. Despite my own heavy background in Health IT, I intentionally stayed away as I’ve stated to many people “health IT is where startups go to die” as the pace of decision making and go-to-market challenges have been epic. Many people’s reaction to healthcare in the U.S. is similar to MidEast Peace. That is, they know it’s a severe issue but it seems almost hopeless. Let me leave you with a final thought of how this country solved another seemingly intractable problem starting about 100 years ago. At the start of the twentieth century, another indispensable but unmanageably costly sector was strangling the country: agriculture. In 1900, more than forty per cent of a family’s income went to paying for food. At the same time, farming was hugely labor-intensive, tying up almost half the American workforce. We were, partly as a result, still a poor nation. As Atul Gawande’s Testing, Testing article goes on to describe, the U.S. addressed that massive issue to the point where we now spend 8% on food and only 2% of the workforce. TechCrunch contributor and venture capitalist Mark Suster has repeatedly stated that entrepreneurs should be solving the truly big challenges in our society — health, education and energy — instead of creating yet another social tool, location-based service or trivial application. As economist Laura Tyson so eloquently put it, “We do not have a debt problem in the US economy, we have a healthcare problem.” Sticking with the legacy fee-for-service insurance model for day-to-day healthcare threatens individual, business, and government budgets. 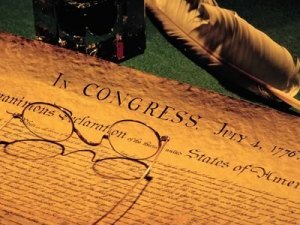 The lowest hanging fruit is removing the 40% “insurance bureaucrat tax” which is why the Declaration of Insurance Independence will unleash the wave of innovative new care and payment models that will be powered by innovation of the technology industry. Get busy!